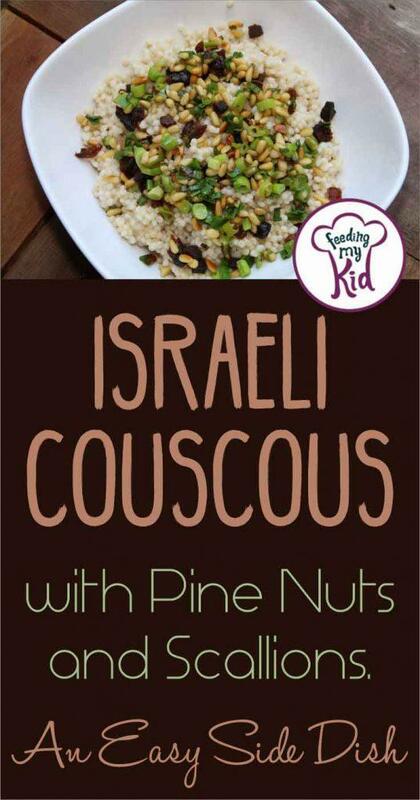 Israeli couscous is such a great addition to tons of meals! This Israeli couscous salad is fresh and filled with yummy flavors. The nuttiness of the pine nuts goes amazing with the bite of the scallions. 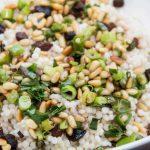 This Isreali couscous salad is so simple! Just cook the pearls according to the package, top with the pine nuts, scallions, and season with salt and pepper. Yum! So easy. I also tried it with dried apricots on top and if gave it that sweet flavor too. You can skip this part if you want. This salad is even great served cold! In fact, I prefer it cold. But you can serve it any way you want! Cook the Israeli couscous according to the package. Slice off the ends of the scallions, keeping the white intact. Dice the scallions all the way down and set aside. Add the tablespoon of oil to a pan over medium heat. Add the pine nuts and scallions in and saute for about 5 minutes, until the scallions look wilted. If you see the pine nuts browning too fast, you can lower the heat. When the couscous is done cooking, drain it and add to a serving bowl or dish. Pour the pine nut and scallion mixture over the top and give it a good mix so everything is combined. Once your dish is plated, top with the dried apricots. Season with salt and pepper to taste and serve immediately. This dish is even great served cold!